In January 1992, I made my first venture into the old states of eastern Europe with a bat visit to Poland. Over the previous three years, the communist bloc had started to break up, travel restrictions eased and opportunities were opened up to visit colleagues beyond what had been the Iron Curtain. I hadn’t been at Vincent Wildlife Trust very long, but our then chairman Vincent Weir agreed I could take my Trust car across Europe for the trip. It was a very long, three-day drive from Wales, with a two-hour delay at the German-Poland border to have our visas checked and cars searched by Polish border guards angling for bribes to speed up the process. Although, as the crow flies, our destination was only 30km from the checkpoint, it was a further three hours’ drive along icy, rutted roads until we arrived in the early hours of the morning at our accommodation in Kaława State Farm. 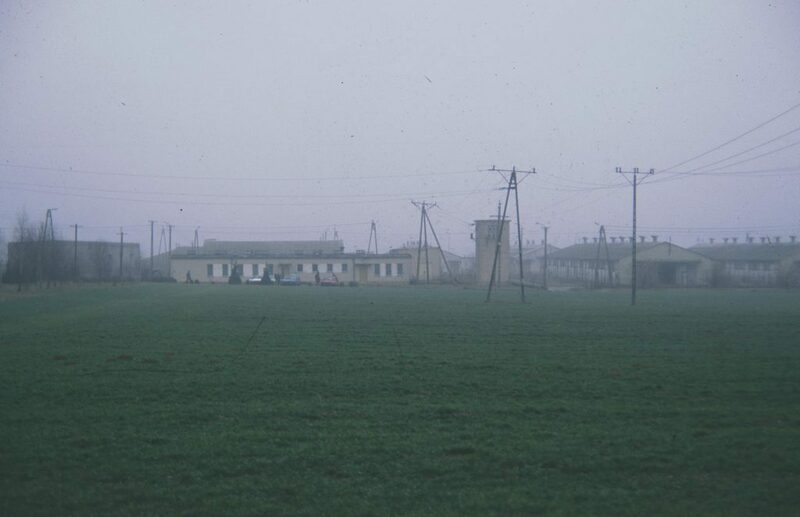 Security lights on high pylons shone through the freezing fog, illuminating the single storey barrack blocks making up the housing for the farm workers. There were no hotels in the area at this time, but the farm manager would rent out one of the barrack blocks to paying visitors. It was a most interesting introduction to Poland! 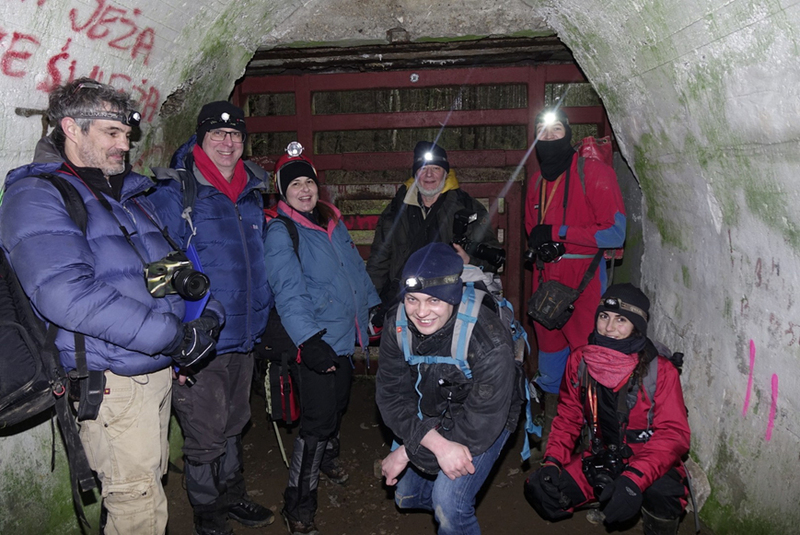 I was part of an eight-strong group who were visiting this area of Poland to explore an extraordinary bat hibernation site. Word had got out in the mid-1980s that huge numbers of bats had been found in a deserted system of World War Two defensive tunnels in the north-west of the country. Our Polish colleagues had secured a small section of the tunnels as a protected area for these bats, close to a village called Nietoperek. Although the system itself stretches under many square kilometres of the surrounding countryside dotted with other small villages, the name Nietoperek has stuck and it continues to be used today. We were guided through the complex of tunnels by Zbigniew Urbanczyk, a Polish bat researcher working on barbastelles. At that time, I hadn’t seen barbastelle in Britain, but here they were hanging in clusters from the walls in their hundreds. The greater mouse-eared bat had just been declared extinct at home, but in Nietoperek we counted thousands of them. We had an extraordinary few days exploring the tunnels and bunkers. In the evenings, we drank vodka with our hosts and discussed bats and politics, occasionally being joined by the farm manager’s daughter, Agnieszka, a sixteen-year-old student who wanted to practise her English. That was my first trip to Nietoperek and it fascinated me. I fell in love with the country, the area and this bat site, and I’ve not stopped going back. After Zbigniew had completed his studies, interest in Nietoperek nationally and internationally continued. It became a key study site for bat hibernation in Poland, and the populations were counted in an ad hoc way until the mid-2000s when winter surveying of the system was put on a more formal basis. Led by my old friend Dr Tomasz Kokurewicz and his colleagues from universities in Wrocław and Gdańsk, the entire system started to be surveyed systematically on a single day in early January and I was lucky enough to be invited by Tomek to help with this annual census. 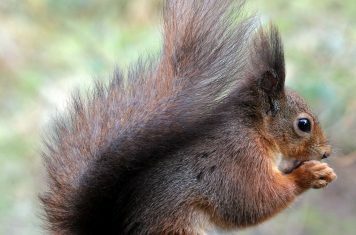 As well as returning to Poland every year for the census, as part of my role at VWT I was involved in developing a management plan for the area: it became a Natura 2000 site (SAC) when Poland joined the EU. VWT has also run research projects with our Polish and Irish colleagues on bats and the martens that frequent the tunnels, so I have had the opportunity to visit the site many times and across all the seasons. Over the years, I have got to know the area and the people very well, and it continues to draw me back. In January this year, I returned as usual for the annual bat census. I flew into Berlin on a no-frills carrier on a flight taking under two hours from the UK and picked up a hire car for the two-and-a-half-hour drive to Nietoperek along the new Polish motorways. We pass through the same old border check point, but as this is now in the Schengen area, we’re no longer stopped and searched. We stay for the weekend in a comfortable, warm welcoming hotel. It’s a far cry from my trip in 1992! 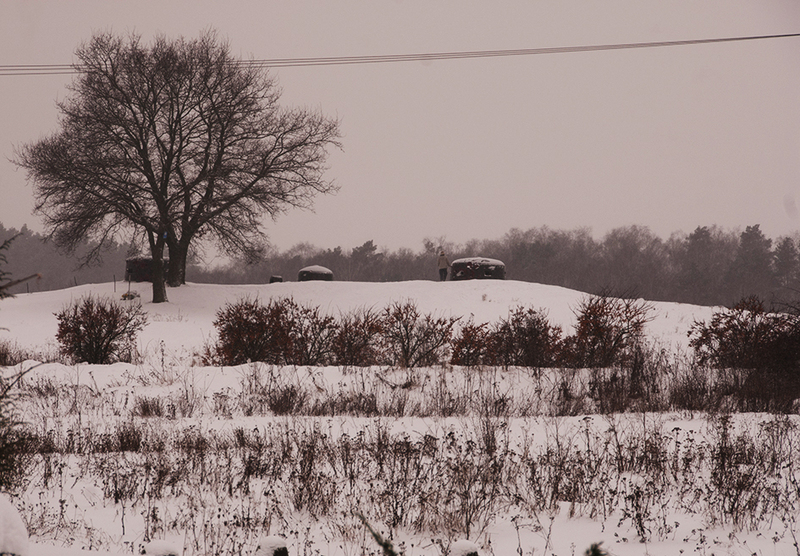 The old WW2 bunkers stand out against the snow-covered landscape. We survey the system in one day to prevent the possibility of double counting or missing bats that may have moved overnight. To do all of Nietoperek in one day is a huge undertaking: we aim to be in the system and in position to start the survey by dawn – a 4:30am start. The 32km of tunnels are divided into nine sections, and it takes a team of over 60 experienced bat biologists to meticulously work their way through identifying and recording the location of all the bats that are present. 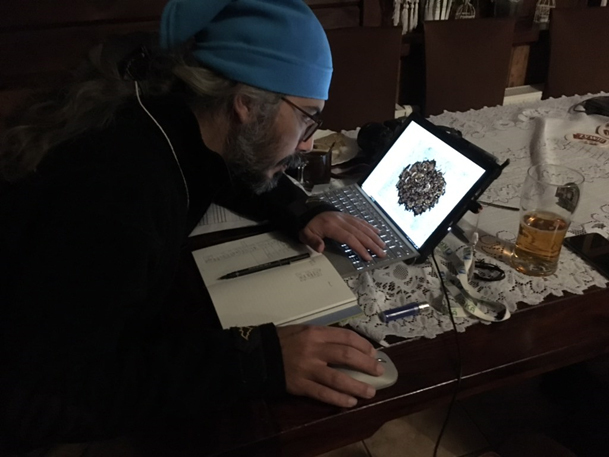 The large clusters of bats are particularly challenging and so we photograph them and use software to count the individual bats when we return to our base in the evening. 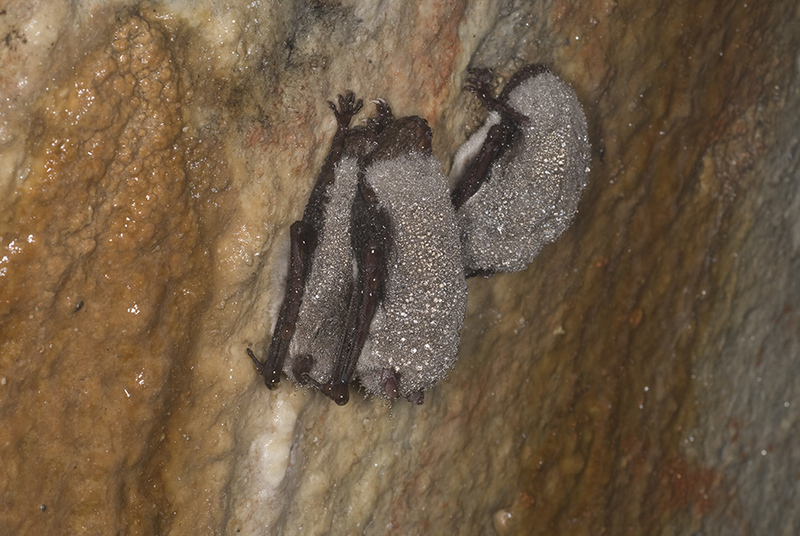 There are nine different bat species hibernating in Nietoperek, including European protected species like greater mouse-eared bat, barbastelle, Bechstein’s and pond bat. 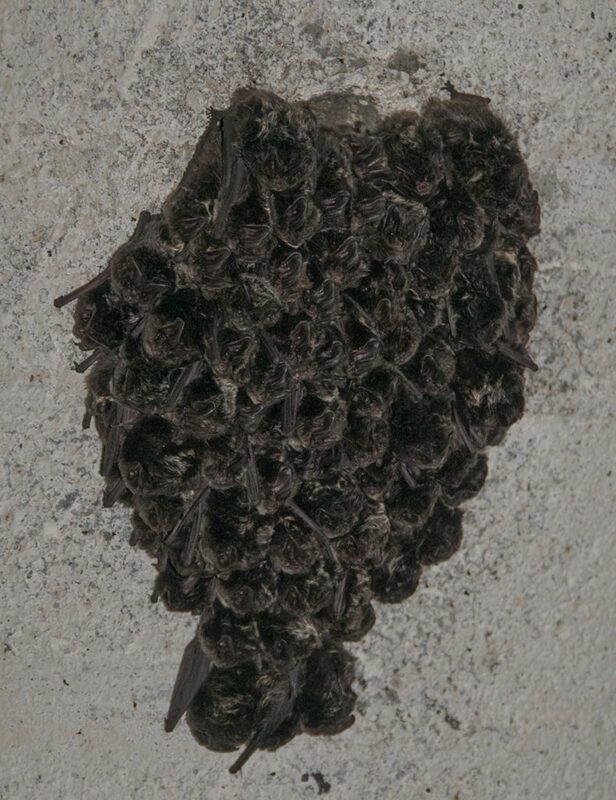 Over the decades the overall number of bats has increased, probably as more individuals have discovered the tunnels. The actual number present is dependent on the conditions over that winter, but it has peaked at just under 40,000 individuals. This January, with a relatively mild winter in north-west Poland, we had around 35,000 bats. The overall increase in numbers masks some quite significant changes in species composition. The large clusters of barbastelles, so common in the early days, have all but disappeared. You can still see the marks on the walls in some of the colder areas of the system where they used to hang. It seems a trend of warming winters means they are no longer forced underground to avoid the double figure minus temperatures we used experience 10 or 20 years ago. On the plus side, we now have many more greater mouse-eared bats hibernating there, some of which are ringed and have migrated over 200km from the east of Germany. In an area of Europe devoid of natural underground sites, Nietoperek is a valuable resource to the bats in the region. Over the years, the census has evolved and improved. As well as the contingent of Poles who organise and lead the census, it has become an international gathering with small national groups from countries across Europe gathering to assist our Polish colleagues. As well as the usual suspects from Britain, Germany and the Low Countries, we were joined this year by teams from Scandinavia, Spain and the Balkans. The census has become an amazing opportunity for information exchange and networking. Alongside the talks around the census results and trend analysis, there are presentations on bat projects in other countries and time to plan other international collaborations. The census day is finished off with the massive job of collating all the results, followed by a celebratory party. It’s been a long time since my first trip to Nietoperek and I’ve seen a lot of changes in that time; this part of Poland has developed but not lost its charm and the Polish people are as hospitable and enterprising as ever. My overwhelming impression on my first trip was of a distant country that had barely emerged from the Cold War, and which felt eastern bloc and quite alien. Nowadays, it is very much part of mainstream central Europe, and something of a second home. As a footnote, I was in a restaurant near Nietoperek a few years ago and by chance I bumped into Agnieszka, the sixteen-year-old student I met on my first trip. She’s in her forties now with a growing family. 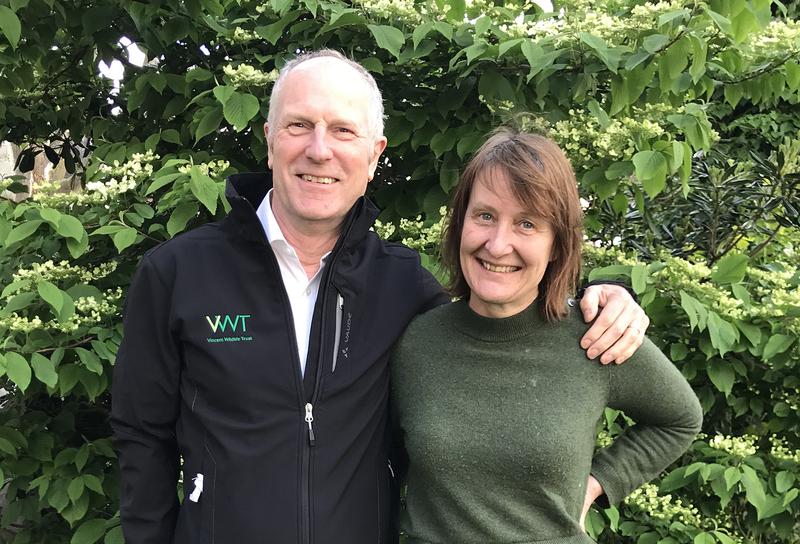 Having studied for a degree in forestry down the road from me at Aberystwyth University, she now runs a highly successful tree nursery back in Poland with her German husband. Europe has become a much smaller place in the last 30 years!